Spring Clean or Summer Panic? It's that time of year again. You know - the time where we all feel obligated to start clearing out the clutter from our homes, dusting away cobwebs and detoxifying all the winter sludgery from our lives. We know this exhausting, frustrating and yet cathartic process will be worth it, but where do we start? Usually, every spring and Autumn I always start my spring cleaning with my wardrobes, as de-cluttering your closets may not make your friends and neighbours envious and wish they had a cleaning lady to come in and do their spring cleaning, but it will give you clarity of mind, an increase in confidence and save you money - who can argue they don't want that? Most women need some good quality 'transition wear' pieces (pieces that will carry you through Spring and Autumn, and in Britain, most of our summer too), with all the good intentions in the world, these pieces just are not available once May is here because retailers buy in their stock 2 seasons or more in advance of the British weather. Meaning, by the time we get any mild sunshine, the high street stores will be full of strappy dresses and linen. Not practical choices for our often inclement spring/summer weather. So whilst it may be mostly too warm for our winter woolies, it is most definitely not the weather for holiday clothes. Therefore, you need to be canny and shop smart. So, i'm afraid, this does mean having a good sort through your wardrobe NOW to identify any missing items that will be needed to ensure your wardrobe will work for you throughout the coming months. However, at the moment I am in the process of moving house, so have been trying to de-clutter whilst packing. This was not one of my better ideas…. I now have more clutter, mess and muddles and am a wee bit stuck… oops! 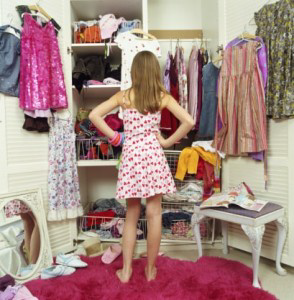 As you follow these tips you should sort all your clothes/accessories into seperate piles. 1) Items that are to keep. 2) Items that need altering/cleaning. 3) Items to be stored for future use, i.e. too small, wrong season, wrong trend or sentimental. 4) Items to be thrown away or donated to charity. This includes anything that does not/will not suit you, anything you do not like, anything that is damaged/past its best. 1. Identify the key 'transition' pieces in your current wardrobe. Note that this should not include any items linen at this stage (these should be reserved for May to September only). 2. Pack away your seasonal Winter items such as coats or heavy jumpers. Winter scarves and gloves can also be stored. I recommend removing items from your wardrobe and folding into either a plastic box, or spare drawers. It is easier to recycle your clothes in this way each season, than have all your clothes hanging in your wardrobe creating confusion. Remove any dated, or ill-fitting items from your wardrobe. You may want to store these away until you have had a professional opinion, as often items can be altered to create a more flattering fit. Familiarise yourself with the seasonal trends, this will enable you to pack away anything that will not be suitable for this season, whilst also preventing you from discarding items that will be on-trend. Remember the fashion industry continuously re-invents previous trends (I have often wished my mother had not thrown away many of her shoes and clothes). 3. Sort through your accessories, belts and scarves. Untangle any jewellery. 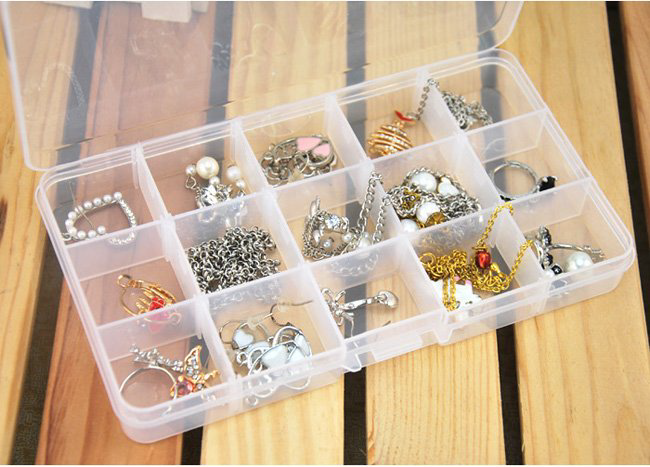 I recommend using craft boxes for storing jewellery in as it will keep it safe and you can easily identify what pieces you have. These can be easily purchased from Hobbycraft or Amazon. 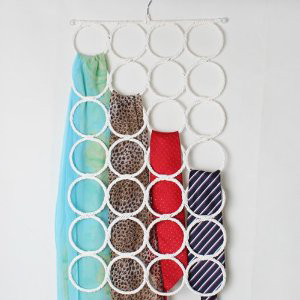 Similarly, use a scarf hanger such as this one from Ikea to keep your scarves neat and tidy. 4. Ensure that any cleaning or mending is carried out. Don't be caught short, as we usually have some gorgeous weather in April. Any missing buttons, get them replaced, any stained items ship off to the dry cleaners, no excuses! Are your summers shoes/sandals and bags worthy to be seen in public, or do they need cleaning or updating? 5. Make a list of missing items, i.e basic cardigan, navy trousers, smart flat shoes, etc. However, it is important to add in here that you should not try to dress like somebody you do not want to be. I encourage women to dress for the person they want to be seen as. 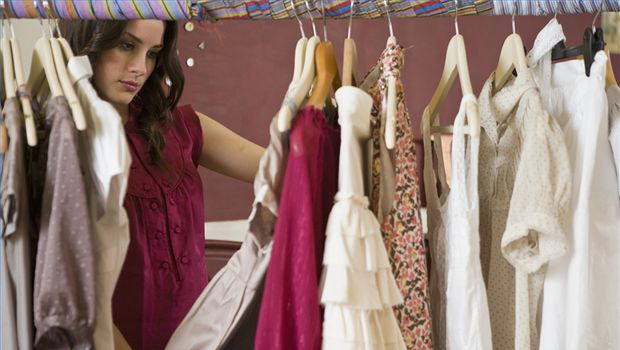 Take this list shopping and use it to 'build' your perfect wardrobe. The key is to buy less but buy better. This will enable you to create a perfect capsule wardrobe, where every item can be mixed and matched with another. Do not consider buying anything just because it is a 'bargain'. There will still be some odd sales around and so unless it is on your list, leave it alone ;-) Even a bargain, when never worn becomes an expensive mistake. Many of my clients have items sat in their wardrobes with the labels still attached. Women really do waste so much money on so called bargains. 6. Once your purchases are complete, start playing with the items in your wardrobe and experiment how many different outfits you can create from the items in there. This is what I do with my clients. You will really be surprised just how much choice you will then have, without having to spend a fortune. 7. Finally, relax and have a smug feeling that you are going to look effortlessly gorgeous this spring, whilst everyone else is getting frustrated with their wardrobes and lack of options. But most of all have fun. Your wardrobe should fill you with joy, not fear.